While I was in the Army in the early 70s, I was stationed in a little picturesque town Southeast of Frankfurt, Germany called Büdingen that grew up in and around a castle built in the 1200s. It was a great place to be stationed, but there wasn't a lot of action there, so we usually went to Frankfurt for that. But most evenings we hung out in the local gasthaus (bar), drinking beer, shooting pool and playing fooseball. One quiet night, I was hanging out with some friends in the gasthaus, when the door opened and much to my surprise a stream of girls started coming in. It turned out to be a group of 17 year old high school girls on a field trip. I couldn't believe my good luck! It wasn't long before I hooked up with a beautiful girl named Ingrid. She had strawberry blond hair, blue eyes, a wonderful body and a very sweet personality. She was from a small town named Diel, in Northern Germany near the Holland border. I was in love...er, lust! But alas, the girls were being chaperoned and there wasn't going to be any hanky-panky. I spent a lot of time with her over the two days she was in Büdingen and we promised to write each other. I kept up correspondence with her over a few months and she invited me to come up to her place for the Christmas holidays. You can imagine what was on my mind at that point. I borrowed a friend's car and drove up to see her. When I got to her house, I met her mother who welcomed me into their home. She told me Ingrid was out riding, so I walked out to the forest trail to look for her. After a while, Ingrid came riding up on a horse and I gasped when I saw her. She was the personification of Nordic beauty! Oh man, I thought. This is just too good to be true. Over the next couple of days, Ingrid and her parents treated me like a king and I was having a wonderful time, but I was dying to get her alone somewhere, somehow. Finally my chance came when we went for an extended walk in the forest. It was really cold and there was snow on the ground, but I was determined! One thing led to another and I tossed my coat on the ground so we could lay on it. I was really going to town when there was an equipment malfunction. It was too damn cold! You'd think an 18 year old guy could get a decent stiffy over someone like Ingrid no matter how cold it was, but I just couldn't manage it. I was depressed and annoyed, but Ingrid said not to worry, that I'd get another chance soon. That night was Christmas Eve. Ingrid and I -- chaperoned by her parents--stayed up late drinking champagne, decorating the tree and having fun. Eventually they all went upstairs to bed and I took my spot on the couch and went to sleep. Some time later, I was awakened by Ingrid, who was bent over me and kissing my cheek. When I opened my eyes and saw her pretty face, she smiled at me and then she stood up and opened her robe to show me her naked body. That was a sight as beautiful as any I have ever seen. She lingered awhile so I could take it all in and then she dropped the robe and climbed on top of me. There are no words to describe just how wonderful those next few minutes were. I was in heaven! But she made a little noise as we finished and shortly after that we heard a sound coming from upstairs. Ingrid jumped up, grabbed her robe and ran upstairs. I didn't hear anything else after that, so I figured we'd gotten away with it. Ingrid's mother snarled at me, "You leave in the morning, Ja?" My heart sank as I nodded and said "Ja." Well, that certainly put a damper on my afterglow. On Christmas morning I was packing up my belongings and about to leave when Ingrid's mother took me aside and said that I didn't have to go, because if I did, the old man would want to know why and she didn't want to tell him what happened. Then she told me to keep my hands off of her daughter. Naturally I ignored that warning every chance I got. 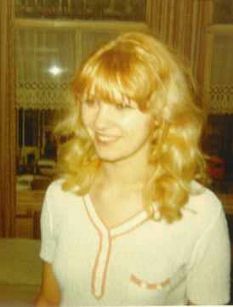 After that visit, I wrote to Ingrid very often and we saw each other quite a bit the rest of the time I was stationed in Germany. She would take the train to visit me for a couple of days or I would take the train up to see her. I guess her mother decided Ingrid was old enough to make her own decisions, because she continued to welcome me into their home and was always very nice to me. When my tour was almost up, I thought a lot about staying in Germany just so I could be with Ingrid, but I really wanted to go home and I couldn't take her with me. Ingrid and I stayed in touch for a while, but like all long-distance romances, our correspondence eventually tapered off. Read about "My Brilliant Career in the Army"